The human brain has evolved for group living. Yet we know so little about how it supports dynamic group interactions that the study of real-world social exchanges has been dubbed the “dark matter of social neuroscience”. Recently, various studies have begun to approach this question by comparing brain responses of multiple individuals during a variety of (semi-naturalistic) tasks. These experiments reveal how stimulus properties, individual differences, and contextual factors may underpin similarities and differences in neural activity across people.However, most studies to date suffer from various limitations: they often lack direct face-to-face interaction between participants, are typically limited to dyads, do not investigate social dynamics across time, and, crucially, they rarely study social behavior under naturalistic circumstances. Here we extend such experimentation drastically, beyond dyads and beyond laboratory walls, to identify neural markers of group engagement during dynamic real-world group interactions. We used portable electroencephalogram (EEG) to simultaneously record brain activity from a class of 12 high school students over the course of a semester (11 classes) during regular classroom activities. 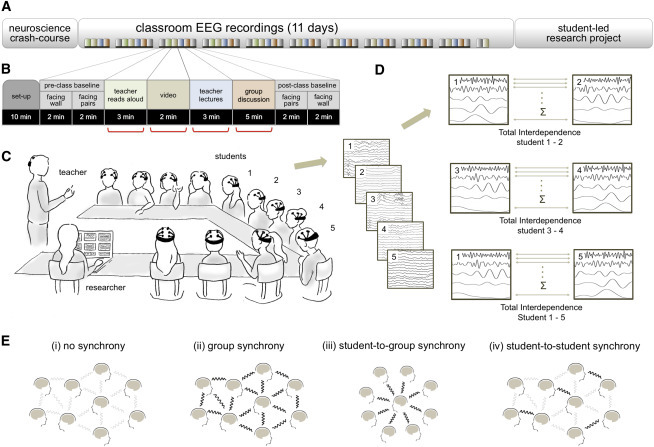 A novel analysis technique to assess group-based neural coherence demonstrates that the extent to which brain activity is synchronized across students predicts both student class engagement and social dynamics. This suggests that brain-to-brain synchrony is a possible neural marker for dynamic social interactions, likely driven by shared attention mechanisms. This study validates a promising new method to investigate the neuroscience of group interactions in ecologically natural settings.